A man walked up and asked, “Do you have free Bibles for atheists?” We assured him we did and had a short conversation about how they are really free and we are happy to give one to him. He ended up taking a “Confessing Christ” as well. He seemed pleased that his atheism didn’t faze us and that we were able to have a cordial conversation. A Muslim couple stopped by and were visibly afraid of taking a Bible. They took a couple of other books, though. I think one was “Mere Christianity” by C S Lewis. 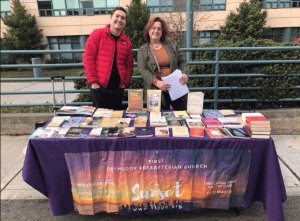 These are two of the stories we heard from Monika from First OPC in San Francisco when she told us about their Bible & Book Table outreach on the campus of San Francisco State University. After reading some of the posts on Outward OPC, she initiated telling us about this project in hopes of encouraging others to do the same if near a university. We were thankful to hear the story and after some follow up share the story with the Outward OPC community. They contacted Student Life on campus and got a prime spot for walking traffic. As a nonprofit, there was no charge to setup. They buy new Bibles from biblesbythecase.com for about $4. They buy books from abebooks.com that include titles like: The Problem of Pain by CS Lewis, Eric Liddell’s biography, and The Sovereignty of God. Most Friday afternoons they set up a table and signboard that says, “Free Bibles” or “Free books- theology, philosophy, biography, literature” and they see who the Lord brings. People man the table to have winsome conversations with people who stop by. Sometimes people hand out tracts. In a little over a year they have distributed over 30 Bibles, 75 books and magazines, and over 3,000 tracts. They’ve talked to scores of people, many coming from very different backgrounds. 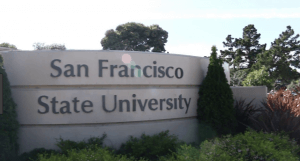 San Francisco State University is not a bastion of conservatism. When they meet people, they pray for them at their weekly prayer meeting. They’ve had one person visit the church. A young man with a Jewish background saw a friend at the table that was a fellow student and member of First OPC. He was surprised and interested to see her there. He has stopped a couple times and taken a book or two. He visited the church and stayed for lunch and continues to stop by the book table on occasion. A young woman walked up in tears and haltingly asked why bad things were happening. She choked out that her good friend had killed himself and that she was suicidal now as well. A rambling conversation ensued where I tried to meet her where she was at and reassure her of God’s goodness and care and the meaning of life. I think she took a book but I can’t remember which one. A month or so later she came by again in a much better frame of mind and said she was on her way to withdraw. She was going home. She decided college was too much for her right now. She expressed appreciation for our care and prayers. She said her family goes to church and she will go with them. A pair of skateboarders came by and we soon discovered they were among those who grind in front of our church. We joked about it a little but did not get ugly about it with them. The one saw “The Screwtape Letters” by C S Lewis and recommended it enthusiastically to his friend, who took it. An elderly Lutheran gentleman stopped by saying he likes theology and took “An Unexpected Journey” about an Arminian’s introduction to reformed theology. A Christian young woman came by and was happy to see the free Bibles and took one for a friend. A couple things are clear in hearing from Monica. The people at First OPC involved in this are focused on the people they meet as people. They take an interest. They pray for them. They treat them as image bearers and meet them where they are in a friendly manner and let the Lord work in and through their efforts. Let’s be encouraged at what this church of ours is doing and be challenged to take these kinds of opportunities in other areas. Thanks, Monica for giving us this story and thanks to all who are serving in this project! 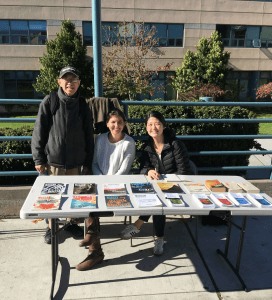 Maybe this effort of First OPC in SF can make it onto your church’s weekly prayer list a time or two and pray for our brothers and sisters reaching out to SF State University.